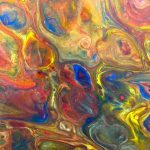 So what is a Pour painting? “Pours” seem to be trending in the art world today. 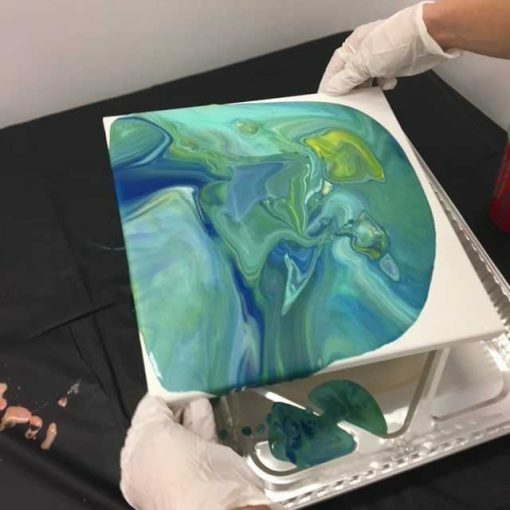 If you remember doing Spin Art at a carnival or at school, then the pour painting artwork is going to be a bit of a throw back for you. The best part is that this art form is all based on the luck of the draw and is stress-free! Each piece is created by the ebb and flow of weights of paint, medium and silicone. The outcome of your art will be a fun surprise and a new discovery each time. Pour painting is a great place for novice artists to start because it is so non-threatening and inviting. Breaking the pour painting process down is very easy. All you need are are cups, any acrylic paint (Folk Art to Goldens will work here), mediums, silicone, and distilled water. The tricky part is controlling the mess because everything shifts like oil and water. There are many recipes out there for this painting process and they can range in price, so choose what works best for you. If you want to try it without the price rage of expensive name brand mediums and the messiness of silicone, you can use Elmers Glue All (not school glue) and acrylic paints . It is important that you use liquid body acrylics for they lend themselves to be poured. Here is our recipe for those who have secured a flat surface space where they can leave their creation for 24 to 48 hours while drying. Mix one part acrylic paint and two parts Elmers glue all together completely. Then add a half part distilled water. Mix all together until you get the consistency of pancake batter. Tip: 1oz shot glasses are great for measuring, but you can also pour all into a cup sitting on a kitchen scale to measure that way. Repeat this process for each color you would like to use. 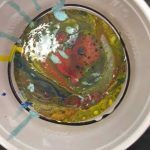 Once you have all three colors prepared, you mix them together in one cup and pour them onto your canvas by turning your cup completely over and lifting up swiftly and completely. Or, you can pour each color on individually and watch them combine. Three colors will produce the best color combinations. Remember starting with primary colors will result in beautiful secondary colors! It is also fun to do something in the same color family like a series of blues and add white, or a series of reds and add a yellow. 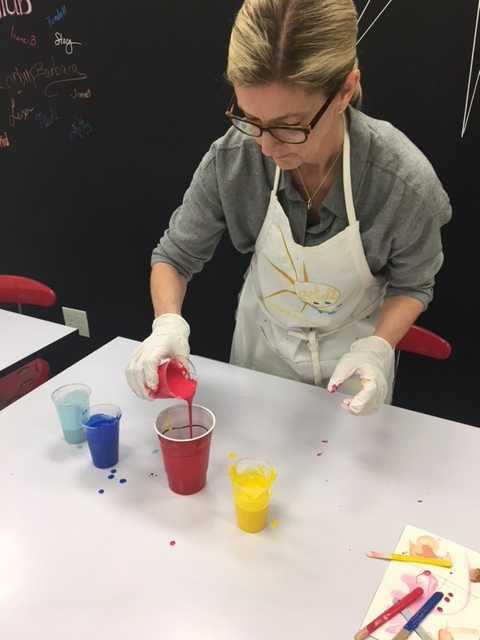 There are endless ways to create your pours and those that are adventurous will experiment with the process trying many different approaches from the dirty cup to a direct pout of each color. How you pour it on is up to you. The key to success is the drying process. You should make sure that you do not move your pour art until it is fully dry — at least 24 hours. The glue recipe does dry faster than if you were using a medium and the silicone. That is why we encourage you to try this at home. 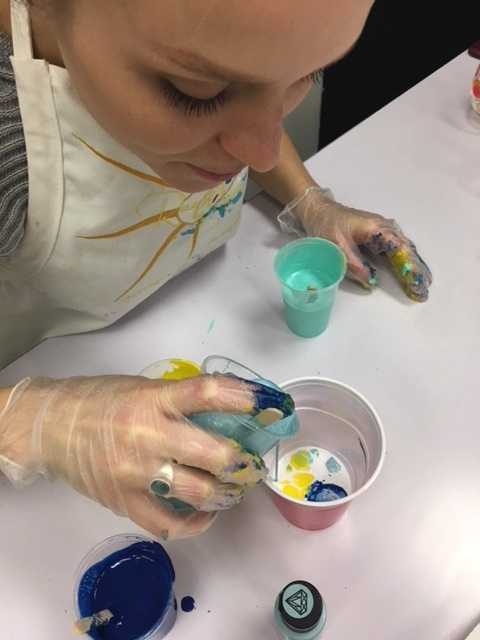 If you want to create a “wow” piece you can always take a Pour it On art class at our studio. 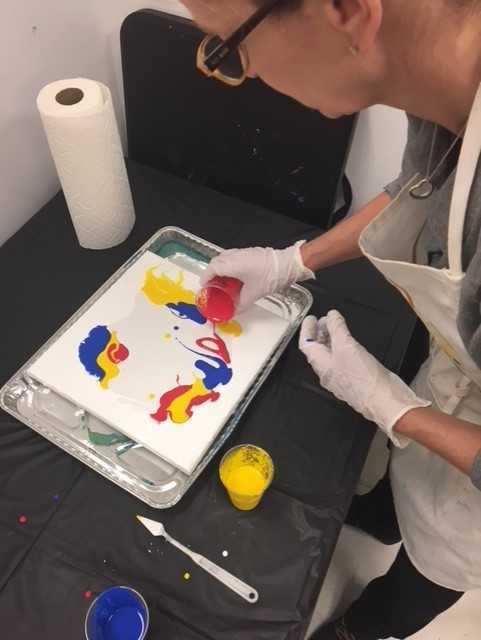 We use the silicone and medium together along with the water and paint, which allows the paint to rise to the surface and pop through creating little “cells” of color. Many of these paintings look like geodes because of the cell formation. Click here to learn more!